In the middle, on the right: Shame on them! Mega b'Ir in Ariel is selling strawberries at 50NIS/kilo. That's about US$13.50/2.24 lbs. 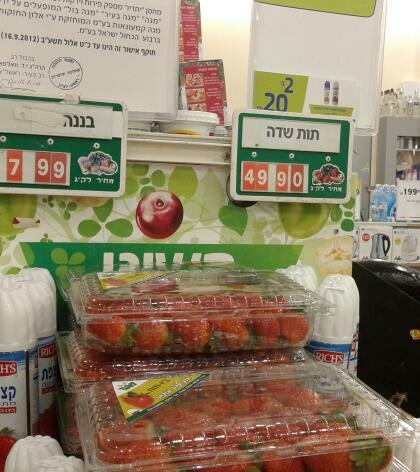 What's even more obnoxious is they're selling wonderful strawberries in the shuk for under 15NIS/kilo ($4/2.24 lbs) but they know they have a captive audience in Ariel since many people don't have cars and can't get to Petach Tikvah or Hod Hasharon to the less expensive supermarkets. Vote with your pocket and don't buy!